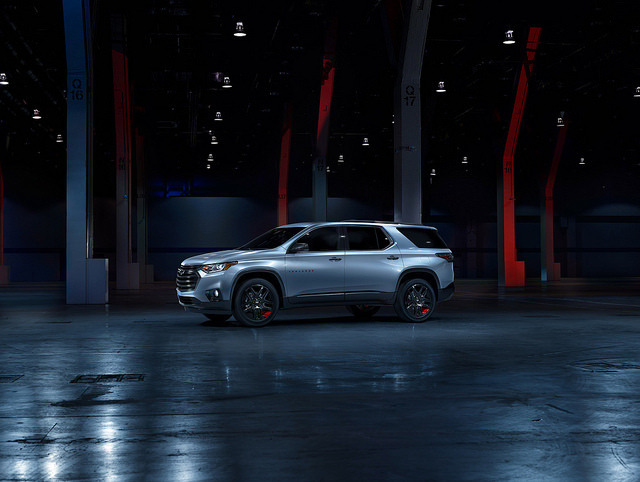 The 2018 Chevrolet Traverse is a bold new SUV that comes with a totally redesigned exterior, exceedingly comfortable interior, and a lineup of turbocharged engines that are both powerful and efficient. The latest in Chevrolet MyLink® infotainment technology works to keep you better connected on the go, and optional all-wheel drive (AWD) is ideal for making sure you get to wherever you want to be whatever the conditions. The 2018 Chevrolet Traverse is available in seven trims: L, LS, LT Cloth, LT Leather, RS, Premier, and High Country. The Traverse L and Traverse RS is only available with FWD, and the Traverse High Country is only available with AWD. All other trims offer FWD standard and are available with AWD. 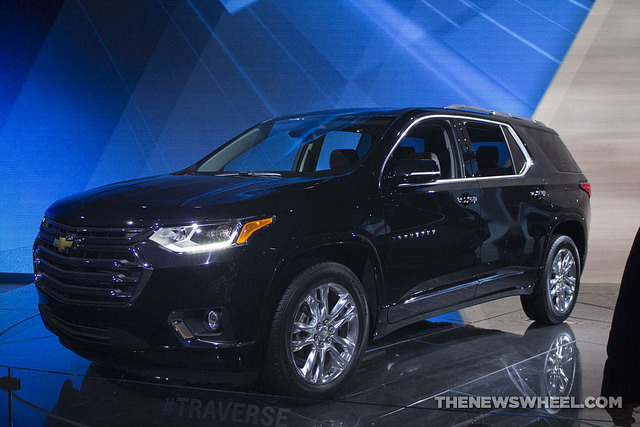 The exterior of the 2018 Chevy Traverse has been redesigned to look bolder and more athletic. Chevrolet has also made sure that the new Traverse is well equipped from the base level up, with features standard on the Traverse L including High-Intensity Discharge (HID) headlamps and LED Daytime Running Lamps, heated and power-adjustable side mirrors, and upper and lower active aero shutters that improve aesthetics and performance all the same. On the inside, the Traverse is every bit as handsomely equipped. Traverse features a standard 7-inch diagonal color touchscreen in the center stack providing control of the latest Chevrolet MyLink® infotainment, as well as comfort amenities such as tri-zone automatic climate control and available OnStar® 4G LTE Wi-Fi®.3 With the Traverse L and LS’s standard second-row bench seat, you can comfortably seat up to eight people while benefitting from a best-in-class 98.2 cubic feet of max cargo space4. Because the Chevrolet Traverse is designed to be a great choice for families, it is replete with passive and active safety features meant to provide peace of mind for the road ahead. All Chevrolet Traverse models are offered with Teen Driver technology, which allows you to let your young driver take the Traverse out and see just how they’re using it. A suite of OnStar services—including Automatic Crash Response, Crisis Assist, and Roadside Assistance—are included to give you confidence. And available feature such as Front Pedestrian Braking, Forward Collision Alert, and Forward Automatic Braking are offered to provide the ultimate sense of security. The new 2018 Chevrolet Traverse is great for burgeoning families, young professionals on the go, or just about anyone whose needs are a bit on the bigger side. With smart technologies, powerful engine options, stylish trims, and so much more to offer, you owe it to yourself to test drive a 2018 Traverse at Landmark Chevy and see just what makes it one of the best SUVs out there. 1 Before you buy a vehicle or use it for trailering, carefully review the Trailering section of the Owner’s Manual. The weight of passengers, cargo, and options or accessories may reduce the amount you can tow. 2 EPA estimated fuel economy. Actual mileage may vary. 4 Based on available 2017 model year competitive information. Cargo and load capacity limited by weight and distribution.